Theo has an IQ of 100 and Aine has an IQ of 125. Which of the following statements do you expect to be true? Campus Reform was notified about the quiz by a student who was completing the assignment as part of the course. The person sent a screen capture of the question. The student who made the complaint asked to remain anonymous. 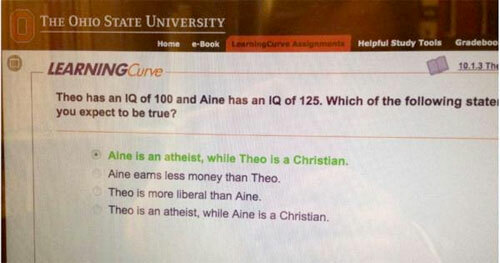 Psychology 1100 is a core class at OSU. This means most of the students will be taking this class. For this particular course, some of the online quizzes are required assignments, but students are encouraged to do all the quizzes in preparation for their final exam. It was uncertain if this question was a required quiz. The student said he or she was not surprised by the question, because of the liberal bias rampant at OSU. Campus Reform was also able to interview a staff person inside the department about the quiz. Like the student, this person also asked to remain anonymous. This staff person said that teacher’s assistants often prepare these online quizzes. But the thing that caught my attention is what is behind all this fear at OSU? The student and the employee were both too intimidated to give their names? What were they scared of? The two obviously believed there would be retribution, either from the school or people, if they used their names. There has been a major change in North American on how Christians are looked on. Some like those at OSU feel they can freely mock Christians with little or no repercussions. As Christians we are not used to dealing with this and the fear and intimidation that comes with it. Don’t get me wrong. I am not sure the two people who chose to remain anonymous are Christians, but they might be. And I would have done exactly the same thing — asked to remain anonymous — if I was in their shoes. But as believers we need to adjust to this new climate of fear that is trying to muffle Christians into silence. If we are controlled by a fear of death we are “subject to slavery all our lives.” The slavery involves how we live. We walk around with our head down, keeping quiet and doing exactly what we are told. We try to blend in so no one will notice us. Not only that, but the devil purposefully uses this fear of death to control us. The demonic tries to intimidate us with fears of mockery, persecution and death. Proverbs 29:25, says “The fear of man brings a snare, But he who trusts in the Lord will be exalted” (NASV). Again it speaks of a form of captivity similar to slavery if we are controlled by a fear of man. Fear is a trap. Satan is the one who sets it. What is the worst thing anyone can do to us — kill us. But notice how the phrase “even death” is added. This means they didn’t love their life for everything in between including mockery to imprisonment. However, once we deal with the ultimate fear — death — we can deal with anything. It is a process. Dealing with the fear of death will enable us to stand up to the mockery and persecution of the new North America. Previous PostWas Karl Marx and the rise of communism influenced by Satan?